At Brennan, we are often contacted for advice during the conceptual phase of a dredging project. This is the time when a client has a goal to dredge a lake, river, etc., however, needs direction on where to start. It is during this phase we often refer the client to a knowledgeable engineer who facilitates the design and permitting processes. Dredge projects can be complicated, and it is important to understand all the factors that will affect the schedule, price, and any environmental concerns. For this reason, we typically shy away from giving detailed cost information and will instead give a general range of costs. For instance, if a client asks how much will it cost to dredge 250,000 cubic yards from a lake, we would follow up with several questions such as; “How big is the lake?” and “How thick is the sediment face?” and “Do you have an area where we can dispose of the sediment?” Then based on our historic experience we can give a conservative ballpark range on what the project may cost. All these questions are important because they are tremendous cost drivers. If the client does not know they answers to these, then we are unable to give good estimates. A good engineering firm can help one navigate all of these questions. They can also help in gaining all the necessary permits for dredging, disposal, and water management. Permits are one area that should never be taken lightly. They take time to acquire, and if they are not in place they can lead to significant delays! Initially, general estimates will be extremely rough, but at the 30%, 60%, and final design point they will be much more accurate. If the project goes to competitive bid, we caution clients that these rough estimates are not final numbers. We build in a conservative factor because, in our experience, cost escalation at the bid phase can lead to headaches for our clients. Mobilizing to a job site is a fixed-cost. This includes transport of all the equipment, such as pipeline, barges, dredges, and all other necessary equipment to carry out the project. Mobilization is usually broken out as a fixed cost because whether you are dredging 10,000 cubic yards or 200,000 cubic yards you will most likely use the same equipment. If you spread it across your unit dredge rate, it will inflate the numbers on smaller projects. It should also be known that multi-year projects will typically hold several mobilization costs because the equipment is usually removed from site for maintenance and repairs during the off-season. Depth of sediment refers to the thickness of the material face that needs to be removed. We have seen a wide variation in face thicknesses such as anything from 25 feet to 6 inches. The thicker the face, it is a general statement that production rates will be better. A thicker face means that the operator can concentrate on production versus a targeted elevation. Also, a thicker sediment face means that the dredge will have to relocated less often. During relocation, production stops so the more you have to relocate, the more production you lose. The type of material that needs to be dredged has a considerable impact. The heavier the material, the more fuel and horsepower you need to maximize production. As and example, when dredging sand hydraulically, the operator must maintain a pipeline velocity of roughly 9 ft/sec to ensure the material does not start to “lay down” in the pipeline and cause a blockage. If he or she was dredging a softer sediment, or “muck”, the velocity is much lower to achieve the same volumetric production. This requires less horsepower to move the material, hence less fuel. Also, harder materials such as clay, gravel, or debris are going to be more difficult to dig and will cause more wear and tear on the system. Material type and face thickness are all characterized during the design process through various tests conducted by the engineer. It takes time to start up all the equipment and make sure everything is operating at maximum efficiency. It also takes time to shut all the equipment down and make sure everything is secured. We often recommend that clients maximize the hours in which they allow the contractor to run. In other words, an 8-hour day is not a cost-effective time-frame in which to dredge. Our experience has shown that working 10-12 hour shifts for 5-6 days a week, with an additional day set aside for potential repairs, is the preferred run-time. There is also the option to run 24-hour shifts, which is the most cost-effective approach because the dredge only has to shut down for maintenance. 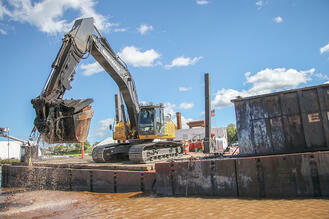 Whatever option is chosen, know that the dredge equipment is capable of handling any run-time you throw at it. Transport distance is the distance the dredged material must be transported after it is removed from the river or lake bed. Whether you are planning to mechanically or hydraulically dredge, transport costs will be dependent on how far the material needs to be moved. For hydraulic transport, the material can be moved over 10 miles. However several booster pumps will be required to achieve the velocities needed to transport the material. If you are mechanically dredging, the farther you move material, the more equipment you will need to maintain cycle times. Here is a little Brennan hint. 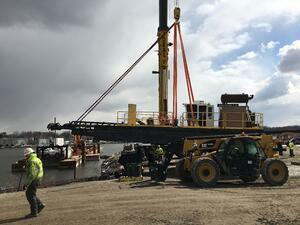 For hydraulic dredging, you will need a booster roughly for every mile that you transport. If you use barges, then the equation will have a host of other variables like drawbridge operations, lockages, and offloading cycles. To maximize value on your project, make sure you weigh both options carefully because every project is different, and costs can quickly go through the roof when something as simple as a drawbridge goes unattended! There are multiple options to consider when choosing a disposal method. 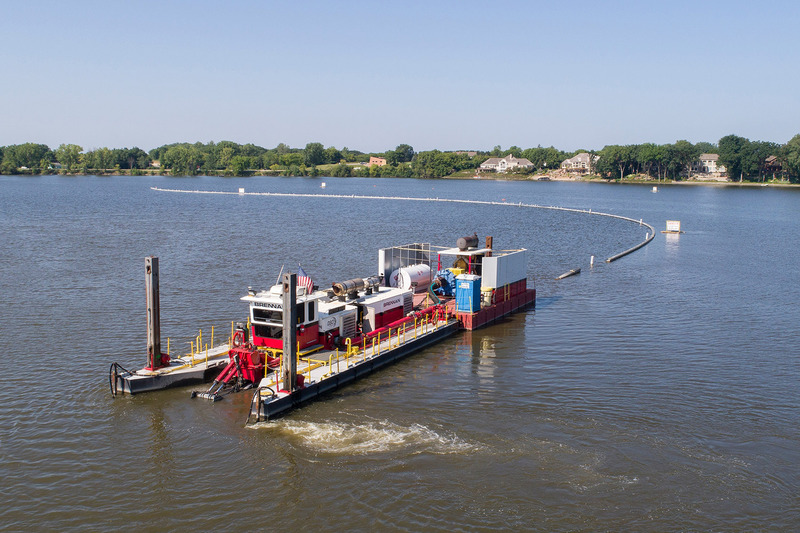 For hydraulic dredging, a settling basin is one option, but using this method involves quite a bit of work before dredging can begin. Typically an area at least twice as big as the total intended dredge volume needs to be created. The reason for this is because the transport water volume is quite significant and the basin must be able to hold enough water to allow the dredge to keep digging. If you are mechanically dredging, you will have considerably less water to manage, but the sediment will be saturated and there will be water management to take into consideration. If the material has to go to a landfill, there will be paint-filter test requirements on how wet the material can be for them to accept it. And, this can vary from site to site. If a settling basin is not feasible, then a dewatering pad could be used. Using a dewatering pad requires a large lay-down area to capture the slurry, filter out the water, and dry the material. This rapid dewatering process will be dependent on the material type. It is very easy to dewater sand and gravel, however, soft-sediments such as muck or clay can require more processing. At last, but not least, managing the water accumulated during the dredging process can prove to be one of the biggest challenges on any dredging project. As the slurry reaches a disposal area, the water needs to be separated from the sediment, collected, then clarified and possibly even treated. If the project is sand or gravel, water management is relatively easy. All you need is a collecting basin and a weir system. If you are dredging soft sediments or clay, then you will need a much more substantial and costly system to manage the water. Here polymers can be utilized to coagulate the sediment and speed up the dewatering process. Much like a sewage treatment plant, polymers can speed the clarification process and are biodegradable. If the sediment contains contaminants such as PCBs, PAHs, or heavy metals, there is also the possibility of using sand and granulated activated carbon (GAC) filters to remove these chemicals from the water. Finally, the local municipality may require you to discharge the water through the municipal treatment plant. If that is the case, that would involve working with the plant to meet any requirements they may have to handle the water. These seven areas are by no means every single cost that goes into a dredging project, but they are a good place to start. If there is one piece of advice we can give to someone setting up a dredge project, it to make sure you look at ways that allow contractors maximize production. On a dredge project, the variable cost per cubic yard will be most impacted by the contractors ability to maximize production. If the dredge is down for any reason, costs are still incurred, so it is important to design a project that will allow the contractor to use every tool in their toolbox to maximize production. This will return the most value to all the stakeholders.